On a Tuli Block Safari in Botswana you will see some of the many species of birds that are endemic to the region. The Tuli Block area is known as a birding paradise as it is home to 350 different species of birds. Most of the Water holes and river systems have permanent water which attracts good numbers of wildlife as well as numerous water birds. Grasses seed during the rainy season and these attracting huge flocks of seed eating birds.In the summer you'll be able to see all the returning migrants, while winter offers cooler temperatures for all-day birding. A three-night stay in any region of the Tuli Block will allow you to see well over 100 species. Commonly seen bird species in the area include Rock thrushes, Boulder chats, Shrikes and Cormorants. Different kinds of kingfishers dart into the streams and rivers, while waders stand in the shallows.A visit to Pel's Pool in the riverine forest along the Limpopo River will allow you to see Pel's Fishing Owls if you are a very quiet, patient birder. Hamerkops, Verreaux's Eagle-Owls, White-backed Vultures and Freckled Nightjars all roost and breed in the area. Giant Kingfishers, African Spoonbills and African Fish Eagles are regularly seen.Driving through the Mopane veld, birders can spot a variety of raptors, including African Hawk-Eagles, Bateleur, Black-chested Snake-Eagles, Verreaux's Eagles and Lanner Falcons. Kori Bustards, Common Ostriches, White-fronted Bee-eaters and Helmeted Guinea fowl occur all over the veldt. Southern Ground-Hornbills, Secretary birds and Great Sparrows are also commonly found here.Monotonous Lark, Temminck's Courser, Lesser Grey Shrike and Red-backed Shrike visit the Mopane veld in summer. 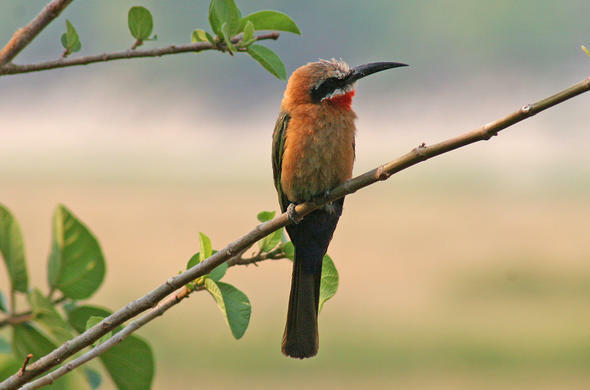 After rains in summer the emerging termites attract flocks of Steppe Eagle, Lesser Spotted Eagle, White Stork, Abdim's Stork, Commom Swift, Amur Falcon, Black Kite and Southern Carmine Bee-eater.